The next DCEU movie on the block is Aquaman and despite being half a year away from release, we know little to nothing about it in terms of official artwork or footage released. That could slowly change as promotional material starts becoming available and one such piece was snapped at the recently held Licensing Expo. 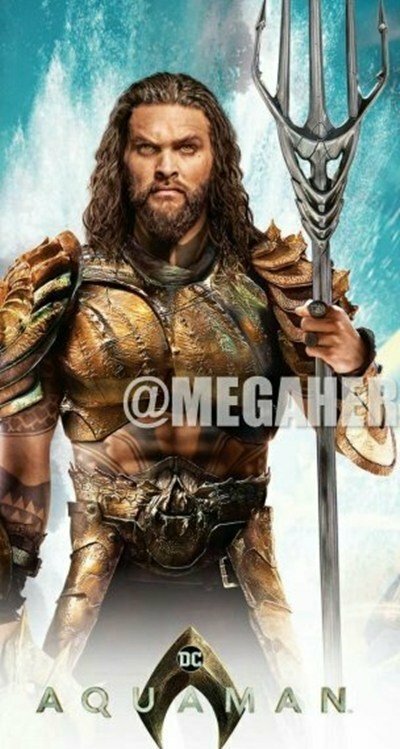 While it’s not an official poster at this point (even though it very well could be), it does give us our first look at Jason Momoa in costume in James Wan’s underwater epic. Have a look. Aquaman promotional material has been non-existent at this point. Previously, director James Wan had cleared the air about the movie’s first trailer, waiting for effects to be ready before showing it to the general public. With Warner Bros. having missed multiple opportunities to release the trailer in the last month, it seems all but likely now that they’re holding off until San Diego Comic Con to release any footage. Unless of course a short teaser, less than a minute long or something, graces the web and sets the internet ablaze before a lengthy trailer follows at SDCC 2018. We’ll find out soon enough. Aquaman arrives in theaters on December 21, 2018.